Most earthquake-related deaths are caused by the collapse of structures and the construction practices play a tremendous role in the death toll of an earthquake. In southern Italy in 1909 more than 100,000 people perished in an earthquake that struck the region. Almost half of the people living in the region of Messina were killed due to the easily collapsible structures that dominated the villages of the region. A larger earthquake that struck San Francisco three years earlier had killed fewer people (about 700) because building construction practices were different type (predominantly wood). 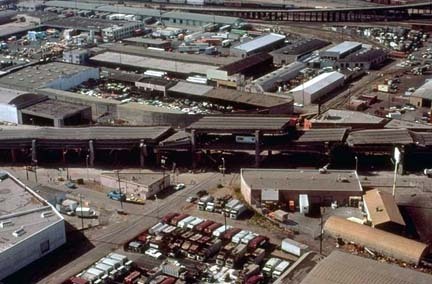 Survival rates in the San Francisco earthquake was about 98%, that in the Messina earthquake was between 33% and 45%) (Zebrowski, 1997). Building practices can make all the difference in earthquakes, even a moderate rupture beneath a city with structures unprepared for shaking can produce tens of thousands of casualties. Although probably the most important, direct shaking effects are not the only hazard associated with earthquakes, other effects such as landslides, liquefaction, and tsunamis have also played important part in destruction produced by earthquakes. When we discussed earthquake intensity we discussed some of the basic factors that affect the amplitude and duration of shaking produced by an earthquake (earthquake size, distance from fault, site and regional geology, etc.) and as you are aware, the shaking caused by seismic waves can cause damage buildings or cause buildings to collapse. The level of damage done to a structure depends on the amplitude and the duration of shaking. The amplitudes are largest close to large earthquakes and the duration generally increases with the size of the earthquake (larger quakes shake longer because they rupture larger areas). Regional geology can affect the level and duration of shaking but more important are local site conditions. Although the process can be complicated for strong shaking, generally shaking in soft sediments is larger and longer than when compared with the shaking experienced at a "hard rock" site. The first step in preparing structures for shaking is to understand how buildings respond to ground motions- this is the field of study for earthquake and structural engineers. When the ground shakes, buildings respond to the accelerations transmitted from the ground through the structure's foundation. The inertia of the building (it wants to stay at rest) can cause shearing of the structure which can concentrate stresses on the weak walls or joints in the structure resulting in failure or perhaps total collapse. The type of shaking and the frequency of shaking depends on the structure. Tall buildings tend to amplify the motions of longer period motions when compared with small buildings. Each structure has a resonance frequency that is characteristic of the building. Predicting the precise behavior of buildings is complicated, a rule of thumb is that the period of resonance is about equal to 0.1 times the number of stories in the structure. Thus Macelwane Hall resonates at about 0.3 seconds period, and Griesedeck at about 1.4 seconds. Taller buildings also tend to shake longer than short buildings, which can make them relatively more susceptible to damage. Fortunately many tall buildings are constructed to withstand strong winds and some precautions have been taken to reduce their tendency to shake. And they can be made resistant to earthquake vibrations. In many regions of limited resources and/or old structures, the structures are not very well suited to earthquake induced strains and collapse of adobe-style construction has caused thousands of deaths in the last decade. The worst possible structure for earthquake regions is the unreinforced masonry (which is common in the St. Louis area). to estimate the maximum level of shaking expected during the lifetime of a building. Constructing accurate hazard maps is a challenge and remains the focus of much Geoscience research. For the Midwest you may want to check out the WWW site of a large multidisciplinary effort to help prepare the eastern US for the low-probability, but high consequence earthquake hazards (check out the Mid-America Earthquake Center). We have two approaches for preparing buildings for earthquakes: you either secure the building components (walls, floors, foundation, etc.) together and have the entire structure behave as a single stiff unit that moves with the ground, or you construct a strong and flexible structure that distorts but doesn't break and absorbs some of the shaking energy. Either approach can be expensive so we cannot build all our structures to withstand the largest possible earthquake. We must make compromises and accept some risk (this is not unlike the risks that we accept every day, driving on a freeway, flying in an airplane, living in flood-prone regions, tornado "alley", hurricane-prone regions, etc.). We need different levels of resistance for different classes of structures. Critical structures such as hospitals, power, water-treatment, and chemical plants, dams, etc. must not only survive the shaking, but must remain in operation. These structure require the largest investment of resources to insure that they can provide services following an earthquake. To insure that we meet these goals we can take a number of steps, beginning with thoughtful and responsible planning and zoning laws. Since we know that sites with soft, water-saturated foundations are prone to damage, we should resist the temptation to build on those sits and we should certainly not put critical structures on such sites, and avoid building on these sites at all if possible. If that's not possible, try to compact the soft sediments before the constructing or anchor the structure in the basement. We can take a number of steps to strengthen buildings including using steel frame construction, adequately securing the structure to the ground through a solid foundation, incorporating shear walls and or cross-bracing into the structure, or more sophisticated approaches such as using rubber or steel pads to isolate the structure from the shaking. We have talked above seismic waves and how they vibrate the ground which can lead directly to the collapse of structures. There are other, secondary effects that are caused by earthquakes, most often a result of strong shaking. A simple example common in many earthquakes are landslides. The shaking causes regions of the rock and soil to slide downhill. 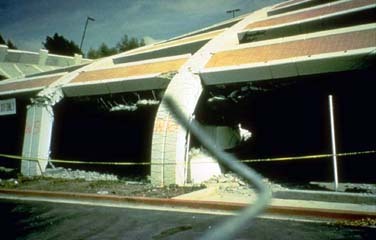 The same material would eventually fail with increased time, but earthquakes trigger many slides that do much bit of damage. Buildings aren't the only thing to fail under the stresses of seismic waves. Often unstable regions of hillsides or mountains fail. In addition to the obvious hazard posed by large landslides, even non lethal slides can cause problems when they block highways they can be inconvenient or cause problems for emergency and rescue operations. 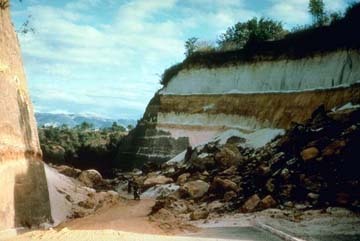 Occasionally large landslides can be triggered by earthquakes. In 1970 an earthquake off the coast of Peru produced a landslide than began 80 miles away from the earthquake. 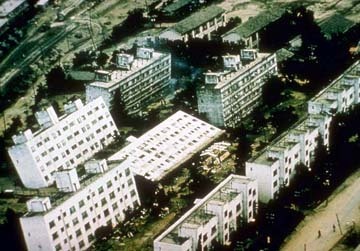 The slide was large (witnesses estimated it's height at about 30 meters or 100 feet), traveled at more than one-hundred miles per hour and plowed through part of one village and annihilated another, killing more than 18,000 people. 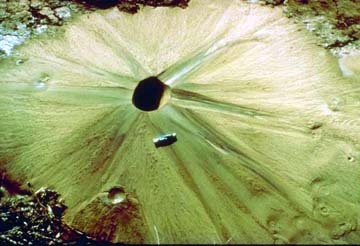 In some cases, when the surface is underlain by a saturated, sand rich layer of soil, prolonged shaking can cause the expulsion of fluid from the sand layer resulting in large "sand blows" that erupt through the overlying strata. In the 1811-12 earthquakes the sand blows were enormous and covered large regions of the Missouri bootheel. Liquefaction can cause other problems as the soil loses it ability to resist shear and flows much like quick sand. Anything relying on the substrata for support can shift, tilt, rupture, or collapse. A sometimes dramatic byproduct of certain types of earthquakes are tsunamis. Tsunami is a Japanese term that means "harbor wave". Tsunamis are frequently confused with tidal waves, but they have nothing to do with the tides, they are the result of a sudden vertical offset in the ocean floor caused by earthquakes, submarine landslides, and volcanic deformation. In 1883 the volcanic eruption of Krakatoa resulted in the collapse of a caldera that initiated a tsunami which killed 36,000 people on nearby islands. On June 25, 1896 an earthquake off the Japanese coast generated a tsunami that hit the shore with wave heights ranging from 10 to 100 feet. As the fishing fleets returned to shore following an overnight trip they found their villages destroyed and 22,000 people dead. In the last century more than 50,000 people have died as a result of tsunamis. A sudden offset changes the elevation of the ocean and initiates a water wave that travels outward from the region of sea-floor disruption. Tsunamis can travel all the way across the ocean and large earthquakes in Alaska and Chile have generated waves that caused damage and deaths in regions as far away as California, Hawaii and Japan. Tsunamis are initiated by a sudden displacement of the ocean, commonly caused by vertical deformation of the ocean floor during earthquakes. Other causes such as deformation by landslides and volcanic processes also generate tsunamis. The speed of this wave depends on the ocean depth and is typically about as fast as a commercial passenger jet (about 0.2 km/s or 712 km/hr). This is relatively slow compared to seismic waves, so we are often alerted to the dangers of the tsunami by the shaking before the wave arrives. The trouble is that the time to react is not very long in regions close to the earthquake that caused the tsunami. In deep water tsunamis are not large and pose no danger. They are very broad with horizontal wavelengths of hundreds of kilometers and surface heights much much smaller, about one meter. Tsunamis pose no threat in the deep ocean because they are only a meter or so high in deep water. But as the wave approaches the shore and the water shallows, all the energy that was distributed throughout the ocean depth becomes concentrated in the shallow water and the wave height increases. When a tsunami approaches the shore, the water depth decreases, the front of the wave slows down, the wave grows dramatically, and surges on land. Typical heights for large tsunamis are on the order of 10s of meters and a few have approached 90 meters (about 300 feet). These waves are typically more devastating to the coastal region than the shaking of the earthquake that caused the tsunami. Even the more common tsunamis of about 10-20 meters can "wipe clean" coastal communities. Deadly tsunamis occur about every one to two years and they have at times killed thousands of people. In 1992-93 three large tsunamis occurred: one in Japan, Indonesia, and Nicaragua. All struck at night and devastated the local communities. At 1:28AM, April 1, 1946, about 150 km (100 miles) south of Unimak Island in the Aleutians, a large earthquake offset the ocean floor and rattled a lightstation operated by five U. S. Coast Guard personnel. 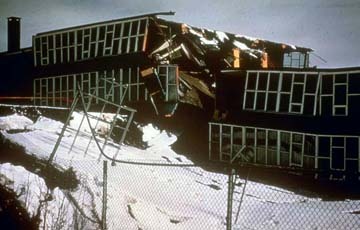 Unknown to the lightstation operators, the earthquake had also generated a large tsunami. It took about 50 minutes for the waves to travel across the shallow continental shelf and arrive at the lightstation at 02:18AM. The weather was clear and calm and the five-story lightstation was about 32 feet above sea-level. The crew heard a large roar from the sea just before a 100-foot high tsunami struck and completely demolished the station killing all inside. At 7 AM, as survivors from a nearby station (located higher up the cliff but considerably damaged and evacuated when the waves hit) were searching for survivors, the tsunami arrived 2200 km at Hawaii away where a series of waves struck the islands killing 159 more people. 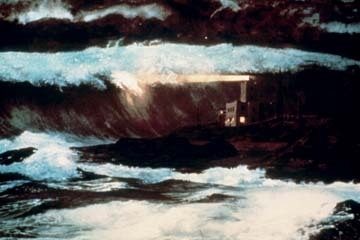 An artist's depiction of a tsunami that destroyed a US Coast Guard Lighthouse in the Aleutian Islands. The tsunami was generated by a large earthquake about 45 minutes earlier (Ms = 7.4, Mw = 8.0, from Kanamori, Mechanism of Tsunami Earthquakes, Physics of Earth and Planetary Interiors, Volume 6, pages 346-359, 1972). A nice site with photos, articles, and links to other tsunami sites. A very nice site with a description of historical and recent tsunamis events. This is a very interesting "log" of a deadly 1946 tsunami. Check out the before and after photos. 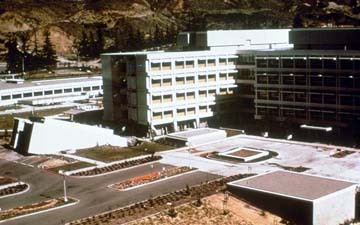 The National Geophysical Data Center, you can access some of the same observations used in scientific research (You'll find earthquake stuff in "Solid Earth Geophysics").